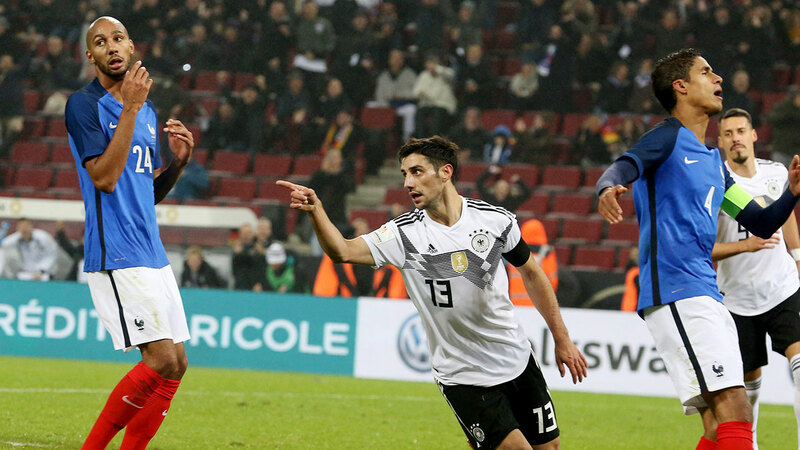 COLOGNE, Germany — Germany substitute Lars Stindl scored in the last minute of injury time to salvage a 2-2 draw against France on Tuesday, preserving the world champions’ 21-game unbeaten run. Alexandre Lacazette’s two goals looked to be sending Germany to its first defeat since losing to France in their Euro 2016 semifinal in Marseille. But Mesut Ozil played a fine through-ball to Mario Goetze, who flicked the ball on for Stindl to fire home. Germany coach Joachim Loew is bound to be concerned by his side’s lacklustre display in the first-half, when France showed all the initiative. Anthony Martial and Kylian Mbappe might have opened the scoring near the half-hour mark when they faced Niklas Suele alone on a counterattack, but Martial delayed his pass too long and Mbappe couldn’t help straying offside. Lucas Digne cut Blaise Matuidi’s cross-field ball back for Martial, who eluded Suele with a wonderful piece of skill and offered Lacazette a simple tap-in. Germany emerged with more purpose after the break and equalized thanks to Ozil. The midfielder waited for the perfect time to play his pass for Timo Werner to run onto and shoot through goalkeeper Steve Mandanda’s legs. Germany’s Toni Kroos rattled the crossbar with 20 minutes remaining before Ozil’s Arsenal teammate Lacazette claimed his second goal of the nighr, scoring through Trapp’s legs after Mbappe had played him in. However, another moment of skill from Ozil helped save Germany’s blushes and earn a morale-boosting draw. Weston McKennie scored in his U.S. debut, goalkeeper Ethan Horvath allowed a seemingly harmless cross to drop between his arms and into the net for an equalizer and the Americans tied Portugal 1-1 Tuesday night at Leiria in their first match since failing to qualify for next year’s World Cup. The U.S. used eight starters 24 or younger in Dave Sarachan’s first match as interim coach, the start of a five-year rebuilding process ahead of the 2022 World Cup. McKennie, a 19-year-old from Texas who has played his way into Schalke’s lineup this season, took a pass from C.J. Sapong, used three touches to create space from Ricardo Ferreira and then beat Beto to the inside post with a right-footed shot from 12 yards in the 21st minute. An embarrassing mistake by Horvath led to the tying goal in the 31st minute. Vitornio Antunes volleyed Bruno Fernandes’ pass toward the goal from a flank, and Horvath missed the ball, which bounced between his legs and into the goal. Horvath, a 22-year-old with Club Brugge, covered his face with his gloved hands. He was making his first appearance since his debut against Cuba in October 2016. Bill Hamid took over in the second half and tipped Goncalo Paciencia’s shot off the crossbar in the 68th minute. McKennie was among three Americans to make their debuts. Tyler Adams, an 18-year-old midfielder with the New York Red Bulls, also started. Cameron Carter-Vickers, a 19-year-old son of former NBA player Howard Carter, replaced John Brooks at the start of the second half and put a header off the crossbar in the 55th minute. Carter-Vickers was loaned this season from Tottenham to second-tier Sheffield United and has started to get playing time. Sarachan was the top assistant to Bruce Arena, who quit three days after the 2-1 loss last month in Trinidad that ended the Americans’ streak of seven straight Word Cup appearances. Right back DeAndre Yedlin was the only player from the starting lineup in Port-of-Spain to open against the third-ranked Portuguese, who also used a mostly young lineup. Brooks, who missed last four qualifiers because of a torn thigh muscle, was paired with Matt Miazga in central defence. Brooks headed the ball in the net off a corner kick in the 44th minute, but the goal was called off because of a push away from the ball by Miazga. Eric Lichaj started at left back. Danny Williams, captaining the U.S. for the first time, was in midfield along with Kellyn Acosta. Agudelo and C.J. Sapong, headed the attack. Goalkeeper Jesse Gonzalez was on the bench but did not make his debut. Josh Sargent, the first American to train with the under-17, under-20 and senior national teams in the same year, did not dress because of a strained right quadriceps.